KCD Co-Chairman Ed Filipowski and husband, former CEO of Barneys, Mark Lee, have listed their Chelsea Penthouse with super agents Jordan Shea, Fredrik Eklund and John Gomes. Unveiled for the first time since its sponsor sale in 2009, the premier penthouse in London Terrace Towers, one of Chelsea's iconic landmarks, is now listed for $8.4 million. The residence is available for purchase with no board approval in the 1929 architectural masterpiece designed by Farrar & Watmaugh which has been full renovated for modern luxuries. The penthouse features triple wrap terraces, quadruple exposures, 11' ceiling heights, a wood burning fireplace, and rare materials throughout. 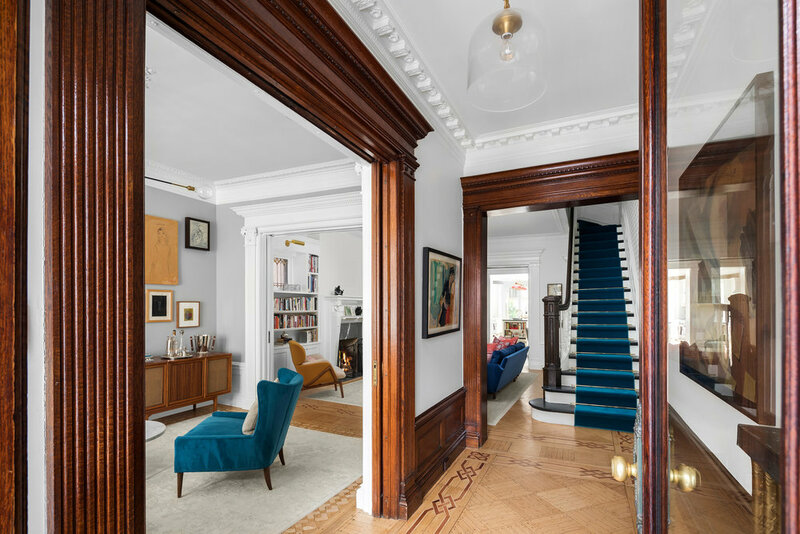 The interiors were designed by Mark Janson of Janson Goldstein is a handsome exemplification of classically modern living, playfully contained within the context of the 1920's. The residence draws inspiration from Rosario Candela, 1940’s cinema, “vintage” modern art, mid-century modern furniture, and the furious world of high-fashion, every niche and crevice of this home sings a song of serene, sumptuous living and grandiose entertaining. The residence's layout features an ornate herringbone patterned vestibule of fumed oak, which separates the twin entertaining spaces in that wing of the home: to the South, the eat-in Kitchen; to the north, the Great Room, office and Library. The Master Suite takes up roughly 25% of the entire penthouse, offering twin bathrooms, twin walk in closets, and twin exposures. Other finishes include state-of-the-art tech, flush-mounted audio components, high-powered water pump to ensure high-pressure from every faucet and shower head, outdoor lighting, dual zoned AC and heat, fully irrigated terrace landscaping, pocket-doors to ensure room usage flexibility, and brand new plumbing / electrical systems. 410 West 24th Street, PHA is currently listed for $8,400,000 with Jordan Shea, Fredrik Eklund and John Gomes of Douglas Elliman. Emily Blunt and John Krasinski have listed their Brooklyn townhouse for $8 million. Located at 586 4th Street, the limestone-clad townhome was originally built in 1909 before undergoing a major renovation by Michael Ingui of Baxt Ingui Architects. The home is 5,200 SF and spread over 7 bedrooms, 3 bathrooms and 1 powder room. It also features old-world style throughout including a large bay window, pier mirror, mahogany accents, outdoor courtyard deck and a black marble wood burning fireplace. 586 4th Street is currently listed for $8 million with Karen Talbott and Kyle Talbott of Corcoran. A stunning new Upper East Side listing has hit the market designed by Taylor Spellman, star of Bravo’s “Yours, Mine or Ours." Spellman is known for her work in high-end residential buildings, and she brought her interior design expertise to 389 E 89 #5H. The unit is a unique, oversized loft that spans 743 SF and is listed for $975,000. Taylor's handpicked selections feature a pastel and gray color palette and soaring ceilings over 10.5 feet. Oversized windows bathe the home in natural light and provide residents with striking views of idyllic, tree-lined streets. Taylor chose a plush sand colored sectional couch with light pink and white accent pillows facing glass tables with oblong gold detailing for the living space, creating a cheerful, inviting ambiance ideal for entertaining or relaxation. The bed is situated off to the right and features an off-white fabric frame and throws that perfectly harmonize the neutral and pink hues found throughout the living area, enabling the two spaces to seamlessly connect. Vibrant décor such as a large pastel pink canvas and a collection of framed photos adorn the walls surrounding the bed creating an elegant and serene aesthetic. Amenities include 24-hour concierge for security and reception services, dry cleaning, valet, 33rd floor lounge and landscaped rooftop lounge with 360-degree view of Manhattan and its surrounding rivers, a state-of-the-art fitness center, children’s playroom, and a landscaped private garden. 389 E 89 #5H is currently listed for $975,000 with Shannon Boudreau of Corcoran Sunshine Marketing Group. 740 Park Avenue is not stranger to the rich and famous. The infamous, ultra-luxury co-op apartment building on Park Avenue between East 71st and 72nd Streets is one of the most luxurious residential building in New York City and home to some of the world's wealthiest including David Koch and Woody Johnson, amongst others. The apartment that Jacqueline Kennedy Onassis grew up in has finally sold for $25.25 to Jacob M. Safra of the banking family. The duplex unit, 6/7A, was listed for $29.5 million and covers 4 bedrooms and 6.5 bathrooms. The total floorplan features 12 rooms including a library, dining room, grand living room with fireplaces, 3 large ensuite bedrooms, media room and a large master-suite complete with 2 marble bathrooms. The unit was recently renovated by Fox-Hahem Associates. Interestingly enough, 740 Park was developed by Kennedy Onassis' grandfather, James T Lee. The 17 story building was designed by legendary architect Rosario Candela and Loomis Harmon and features 31 units. The sale of 6/7A closed for $25,250,000 and was overseen by Oren and Tal Alexander of The Alexander Team with Douglas Elliman.